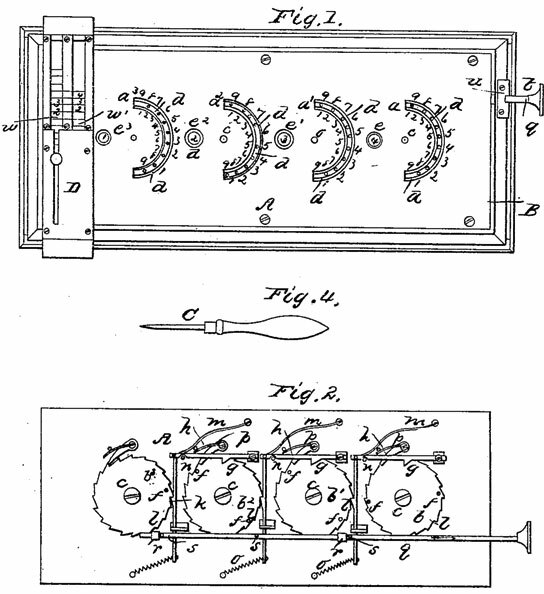 In 1866 Samuel J. Kelso of Detroit, Michigan, patented (US patent №58347) a ciphering machine. It was an adder, quite similar to one of machines of David Roth. The machine (see the lower patent drawing) can be used for adding, subtracting, and multiplying numbers of any desired magnitude with the greatest ease and facility. For adding and subtracting a series of wheels are used, which revolve on suitable pins projecting from the under surface of a plate of sheet metal or other suitable material. Each of the sheets is provided with ten or a multiple of ten holes or cavities, and the face-plate is provided with semicircular slots, and with numbers from 1 to 9 on the convex sides of said slots for adding, and from 9 to l on the concave sides for subtracting, and a suitable carrying mechanism is combined with the wheels in such a manner that whenever one of the wheels is turned for ten holes or cavities the next succeeding wheel will turn for one cavity. The carrying mechanism is composed of a series of compound pawls, each constructed of two rods, one of which is hinged to the under surface of the face-plate, and provided with a nose or cam, to be acted upon by a pin projecting from the appropriate wheel, whereas the other rod is hinged, to the loose end of the first rod, and provided with a tooth, which catches in the next succeeding wheel in such a manner that whenever the pin of the first wheel passes the nose or cam of the main rod the second wheel is turned one tooth. A rod sliding in suitable sockets on the under surface of the face-plate serves to throw the carrying mechanism out of gear, so that each of the wheels can be turned independent of the others. The multiplying device consists of a carriage, which is fitted on the case containing the adding and subtracting wheels. By the application of the disengaging-slide q the operation of setting the wheels back to 0 is materially facilitated, and much time is saved in the operation of the machine. Who was the inventor Samuel J. Kelso? Samuel John Kelso was born in 1835 in Ireland (or Scotland), to Henry Kelso (b. 1800) and Charlotte L. Kelso (b. 1806). In early 1850s the Kelso family lived in Glasgow, Scotland, where Henry Kelso was a teacher, and Samuel used to work as engineers clerk. Samuel had an older brother, David (b. 1832) and a younger sister, Charlotte (b. 1836) and brother Josiah (b. 1841). Samuel John Kelso immigrated to the New World in late 1850s and settled initially in Quebec, Canada, then in Detroit, Michigan, USA. In early 1860s he worked as an agent of Scottish Amicable Life Assurance Society in Chicoutimi, Saguenay, Canada. In 1867 Kelso married to Hannah Roadhouse (b. 1844), a Canadian from Albion, Ontario, and they had 6 children: Elizabeth (b. 1868), Caroline V. (b. 1870), Belle (b. 1872), Karl W. (b. 1873), Alfred N. (b. 1876), and Walter Rhodes (1882-1948). Samuel John Kelso was a holder of another US patent (No. 477942 from 1882) for a slip-holder, as well as of a Canadian patent (No. 1121 from 1860) for an "aqua-gravitation engine". In 1862 he published a book—"Notes on the Saguenay for tourists and others".